Prevention is the best fire fighting technique. Something as simple as a smoke detector can act as a warning signal to spur you into action when the worst happens. It might be as simple as turning off the stove and opening a window to blow out the smoke. But what do you do if a real fire starts? Every extinguisher is different, so it’s important than when you purchase one (or come into possession of an existing one) you research the manufacturer’s specifications for your specific model. It should be also noted that proper care can extend the life of an extinguisher, while improper care can shorten it. 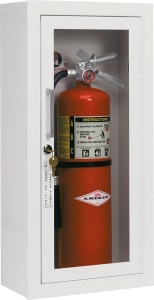 Most fire extinguishers have a lifespan between 5-10 years. Unlike food left in the fridge too long, it’s not the contents of the extinguisher that go bad but rather the container itself. Fire extinguishers are under pressure, and can eventually develop leaks in there seals, or damage to their bodies that would inhibit their performance in the event they were needed to put out a blaze. Portable fire extinguishers can have essentially endless lifespans, assuming they are well-maintained, and checked frequently to ensure they are in working order. The easiest way to ensure your extinguisher is equipped to tackle a fire is simply by checking the pressure gauge. If it registers the appropriate pressure, odds are no leaks in its seal or damage to its external body has happened and it will probably perform as expected. However, relying on the gauge is often not enough. For one thing, how can you be one hundred percent sure the gauge is functioning as it should? Plus, there’s plenty of other things that could go wrong with your extinguisher besides a drop in pressure. From clogs, to cracks in the hose, there are aspects of fire extinguisher maintenance the layperson is probably not aware of. That’s why it is important to consult the manufacturer’s handbook, and schedule maintenance and checkups as it recommends. Not sure if your extinguisher is still up to snuff? Call a professional to inspect it before purchasing a new one you might not need. It’s important to keep your first line of fire defense in tip-top shape. Make sure you’re aware of the manufacturer specifications, assess whether it maintains pressure and always have it inspected by a professional. Want to learn more or schedule your next fire extinguisher maintenance? In the market to replace an aging or expired fire extinguisher? Don’t wait — contact All Florida Fire today!